Holy smokes, 78 storeys? What a beast! Aura, the College Park condo tower by Canderel, was already slated to soar to incredible heights but thanks to a decision by the City’s Committee of Adjustment, it will rise even higher than previously planned. The skyscraping condo tower will now stand at 78 storeys (up from 75) and 273 metres, easily making it the tallest condo tower in the country. Three additional floors mean more units — 50 new condo suites to be exact. Aura will now contain an astounding 985 units. Some of those units will be Aura’s penthouse collection of suites, starting at the 75th floor. Penthouses start from $2.3 million and one astonishing suite is priced at $18.3 million. The singular penthouse is 11,370 square feet and is “among Toronto’s most exclusive real estate listings,” according to Riz Dhanji, Canderel’s VP of Sales and Marketing. This entire project is quite something and definitely signals the commencement of some next level condo development in Toronto. If the 78 storey height isn’t enough to convince you, how about the 180,000 square feet of retail space? Or maybe the fact that the total square footage of the project now stands at 1.3 million. 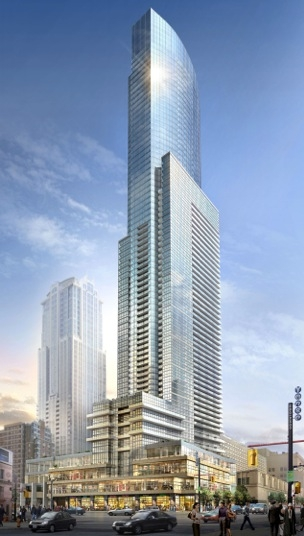 We’re just looking forward to looking up at this incredible project every time we’re around Yonge and Gerrard. But considering its height, we’ll probably be able to gaze at it from miles around too!